To learn more, contact one of the instructors listed below. Marie has always had a passion for challenging movement and exercise. 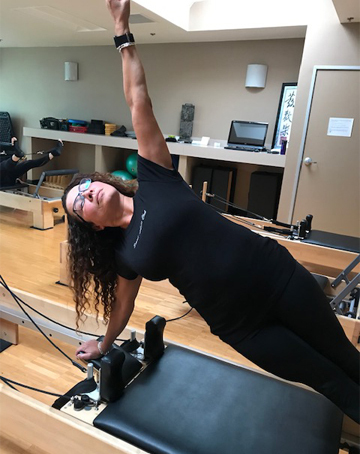 After spending years encouraging others to experience Pilates for themselves, Marie decided to go through Stott Pilates training so she could be the one to introduce this functional movement to clients. As an instructor, she has a great appreciation for Pilates’ adaptability, being able to meet her clients wherever they are now, and continue to build from there. She has a passion for making people feel their best through the practice of Pilates and her goal at the end of each session is to have people feeling stronger, more flexible and relaxed. Marie is also a Personal Trainer and Group Fitness Instructor – as well as being Barre Above Certified. Jane has worked at Sunset Athletic Club since 2004. She has graduated from BYU Hawaii with a bachelor’s degree in Exercise and Sports Science. She has worked in the fitness industry since 1996 as a Personal Trainer, Group Exercise Instructor, Group Exercise Master Trainer, Pilates Trainer and Group Exercise Manager. Throughout her many years of experience, she has worked hard maintaining her education and certifications in many different aspects of fitness. She has had the following certifications and trainings: ACE Personal Trainer, AFAA Primary Aerobic, Mat Pilates, Pilates Reformer, Pilates Exo Chair, Turbo Kick Box, Crush Kick Kickboxing, Body Pump, Body Combat, Rep Reebok, Reebok Core Board, Precision Cycle and Stability Ball. She believes in the importance of flexibility, strength and cardiovascular fitness. Her expertise consists of weight loss and muscle toning, helping clients improve their quality of life. Jane is an avid runner completing several half marathons yearly. She has four children. Pilates has helped build her core back after each child birth and helped her return to running. Through taking Pilates classes you will improve your flexibility, build a strong core and develop lean long muscles. Julie is passionate about helping people of all ages and all abilities discover the benefits of Pilates and how it can change their lives. She has been training people for 20 years and has seen first hand how Pilates can help people increase strength, lose weight, feel better and improve mobility. From rehabilitation to athletic training Julie has helped people gain a balance of strength and flexibility that improves all aspects of their lives. As well as training in Studios, Julie also works in the Chiropractic industry doing Pilates rehabilitation on patients recovering from injuries and accidents. Julie’s enthusiasm is contagious and she enjoys sharing her passion with her clients! Let her extensive training and knowledge show you what Pilates can do in your life! I started training with Julie when I was in my 30s. Pilates changed my mind about what exercise should be. I was stuck in a cardio rut and spent most of my time on the elliptical and treadmill. Once I started training with Julie on the reformer I realized how much I had been missing by not incorporating strength training into my routine. I became addicted and started seeing the results immediately. Julie’s energy and enthusiasm made the class fun, and her knowledge and ability to recommend modifications made it so I could get a great work out no matter what. Now that I’m in my 50s I can’t imagine not doing Pilates, and I’m grateful that Julie showed me how beneficial it could be. I have trained with Julie for many years, first in a Pilates mat class and quickly switching to a reformer class. She is extremely knowledgeable and easily accommodates the differing abilities and potential health issues of her clients. I have recently recovered from cancer surgery and chemotherapy. Julie has been very conscientious and helpful easing me back into my Pilates routine. In addition to being a seasoned professional Julie always makes Pilates fun! I love my Pilates class. Julie is a fantastic instructor who makes the class fun and at the same time is attentive to our technique and makes sure we don’t injure ourselves. I have taken many classes over the years and they usually lasted one or maybe two years. I have been in this Pilates class for over 10 years. The benefits I get both physically and mentally are huge. I am a marathon walker and have noticed how much better I feel after a marathon than I did before taking this Pilates class. I credit Julie for this as I trust her and her experience. I look forward to my weekly Pilates classes with Julie, because not only do I get a great workout, but I am able to experience it in a group setting with an attentive teacher and fun atmosphere! After years of back problems that didn’t get better with surgery or Physical Therapy I sought out Pilates. Julie told me “Just give it 10 sessions, if you don’t see improvement you can stop”. It only took me five sessions to see a change, and after 10 sessions I was pain free and able to golf again! After one year of working with Julie I looked and felt different. Julie knows her stuff, takes her time and cautiously pushes her clients to a place of strength. I have been training with Julie for two and a half years. Julie does an amazing job of tailoring the exercises to fit everyone in the class, taking into consideration our various ailments and health history, by changing springs or positions. She has been totally supportive of my health and fitness goals. I have lost weight, gained muscle and found that doing Pilates makes my other fitness classes more effective. Pilates has strengthened my core and given me the stretch I need to move my body better both in exercise and daily life! With more than 30 years of teaching experience in the fitness world and a passion for Pilates, Jill would be honored to help you on your path to wellness. Since her first Pilates class in 1998 Jill knew she wanted to teach and in 2008 that opportunity arrived when Sunset Athletic Club opened a beautifully equipped studio. She soon began training with Balanced Body Pilates, completing her 400 hour comprehensive training in 2010. Teaching to clients with different needs over the next few years led Jill to pursue additional training and in 2015 she completed a second 400 hour course with Body Arts and Science, focusing on rehabilitation and alignment. If you decide to train with Jill you can expect mindful and focused instruction tailored to help correct postural imbalances. She loves teaching the basics, introducing all fitness levels to this amazing, addictive workout. Considering the session that really says something about what you do. I am grateful for what you have accomplished. Thank you! You are a miracle worker. I’m still walking with no pain. Not sure if I’ll do back class in morning. Hate to take a chance of ruining this good feeling. Thanks again. Ok Jill you solved my sore knee problems! I have been leaning too much on my toes and not on my heels while walking. Better posture and more weight on my heels makes a ginormous difference. Did a slow 3.5 mile walk today slowly and minimal knee pain. Will keep you posted. SWEET!! Thx. Just wanted to let you know I appreciate all your Pilates expertise. I have a long way to go but already am noticing positive changes. Thanks! Jill just wanted you to know that the “folding “ in addition to the other exercises, completely relieved my chronically tight and sore SI joint. Thank You! Giving you the happy dance!